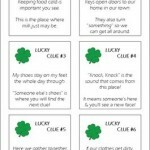 My kids love treasure hunts so I use various holidays through out the year to send them on hunts from searching for their Heart filled baskets on Valentine day to the traditional hunt for eggs on Easter. These hunts are all about them and what they can find and keep for themselves, which is fun but this year I am working hard at finding ways to teach my children to make a difference in the lives of others by doing, giving and sacrificing for others. So how does one do that with a hunt on St Patrick’s day? Simple with this idea I found over on Jesse Kate Designs. 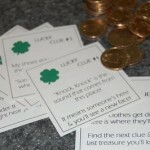 A fun St. Patrick’s day treasure hunt with a meaning where your children hunt for gold $1 coins ( you provide) with the 6 clues you can print out for FREE from Jesse Kate Designs. Once they discover all of their coins you present them with another free printable that explains to them that as a family you are now going to decide how to give back to someone else using the coins. 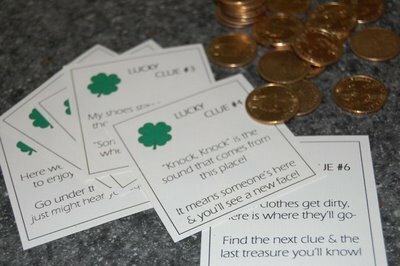 I can’t wait to hear what my children will dream up to do with their coins after our hunt on St. Patrick’s day. 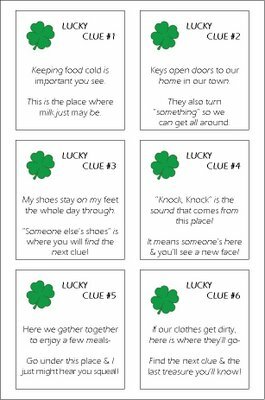 Click here to get your FREE St. Patrick’s Day hunt with a meaning printables from Jesse Kate Designs.